Can you detect proton transfer (<0.5 Å) in microseconds? 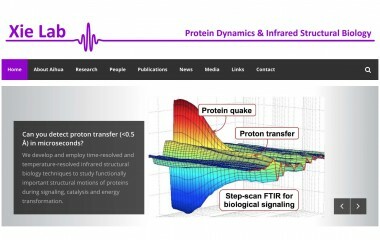 We develop and employ time-resolved and temperature-resolved infrared structural biology techniques to study functionally important structural motions of proteins during signaling, catalysis and energy transformation. Can you find structural information from infrared spectra? We study how proteins do their work. Proteins perform their biological functions via a series of structural transformations. We develop and employ a powerful emerging technology, time-resolved infrared structural biology (IRSB), to capture the functionally important structural motions of proteins. The simultaneous detection of structural, kinetic and energetic data on proteins in action provide rich information for mechanistic studies of proteins. The Earth is home to an estimated 10 millions of different insects and as many as 10 billions of billions of different bacteria. So the total number of different proteins on Earth can exceed 30,000,000,000,000 billions (10^22). What is a realistic approach to understand this vast number of different proteins underlying our diverse bio-world? We need equivalents of Newton’s Second Law (F = ma) in biology! One of our research directions is to explore general principles that control protein structures, dynamics and functions. Xie directs an Advanced Infrared Biology (AIRB) Lab that is equipped with eight types of advanced Fourier transform Infrared (FTIR) techniques, including nanosecond FTIR, cryogenic FTIR, micro-fluidic FTIR, and biochemical FTIR imaging at Oklahoma State University. This is a rare lab worldwide with such diverse types of advanced infrared technologies dedicated to protein and biological research. These cutting edge technologies (supported by NSF MRI & OSU) combined with Xie’s extensive experience and vision in infrared biology open up opportunities for unprecedented research and discovery in physics of proteins. Welcome to the new Xie Lab Website!